0 Comments Published by Terrace Crawford on 12/31/08 at 8:01 AM. Part of my role here at Cornerstone is overseeing the Children's ministry. Two weeks ago I had the privilege of leading the Children's worship service that day and called on one of our first graders to lead in prayer. I just love to hear children pray. "Dear Jesus, I pray that everyone has a wonderful Christmas... especially people in New Zealand and Australia. Oh, and people on the beach too. Amen." Wha? I love the innocence. The randomness. To my readers in New Zealand and Australia: Susanna hearts you! She rocks. 22 Comments Published by Terrace Crawford on 12/30/08 at 12:13 PM. I'm giving away a shack. Actually, a copy of The Shack. ;=) Not only was The Shack probably my favorite read of 2008 but I got to hear William Paul Young interviewed at Catalyst and enjoyed being a part of a special Shack discussion group earlier this year. I want to give you the opportunity to read this book and let me know what you think! I'm giving away one, free copy of the book at random here. All you have to do to *enter is leave your full name, location [city & state], and your blog or website URL [if applicable] in the comments of this post by Friday, January 2, 2008 at 5:00PM est. One winner will be chosen (at random) after the contest ends. *Only one entry per person. TODAY IS THE LAST DAY TO DONATE in our special 50,000 pairs in 50 days challenge. Please, go donate and help make a big time impact. 5 Comments Published by Terrace Crawford on at 4:30 AM. Pastor Rick Warren was asked by Barack Obama to deliver the invocation at the presidential inauguration next month. After this announcement was made the media fire storm started and things soon got ugly. The public began to chime in and comments even had to be shut down on some of the press blogs. I honestly could not believe the drama. I do understand that a lot of the hype came from the fallout from Warren's stance on Proposition 8 but did it really have to get this ugly over someone praying before the ceremony? We have hit a new low point in America. Seriously. Obama has made it clear from day one that he truly wants everyone to be welcome at the table. He really preaches equality for all and the president-elect asking Warren, quite possibly the most well-known evangelical, to be a part of the ceremony (among others he invited) underscored this. 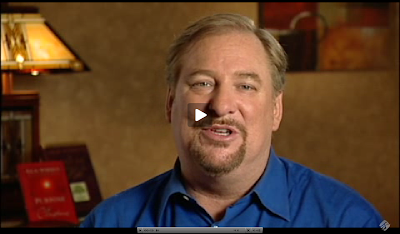 I have so much respect for Rick Warren. I could not agree with him more. I respect his leadership and I am very thankful for the platform he has been given. Click here to watch his video response. 3 Comments Published by Terrace Crawford on 12/29/08 at 3:46 PM. This is the Manic Monday Minute ladies and gents - post-Christmas edition. What a great week. I really enjoyed the holidays with my family. It was nice not doing anything but eating, sleeping and opening presents. Watched several movies this past week. YesMan (which was good) and a few repeats - Kung Fu Panda and The Dark Knight. I love my family. We had such a great time hanging out! Holidays and vacations are never long enough. I cannot believe its almost 2009. I'm doing a bit of goal setting for the new year. I'm expecting GREAT things in the year to come. Haven't taken down the Christmas tree just yet. I'm seriously debating on keeping it up another week. Maybe not. The weather has been crazy! Yesterday (here in Norfolk\Va Beach) it was 76 degrees. Today it was 48 degrees. Wild. Make sure you hit my site tomorrow. I'm giving away a little something, something. Here is a clue: It was ranked #1 for the year 2008. Didn't get to read at all during the holidays. Kind of a bummer. There is literally only 1 day left to buy some shoes! PLEASE, go donate if you haven't already. I must say that I have been surprised there haven't been more donations for this great cause. We've come so far... but have so far to go. I filled up my gas tank today and the tank asked me for my zipcode. Apparently that is common the further you go out west. I've never been asked that. Watched serveral church's Christmas services online. I enjoyed every minute of it. 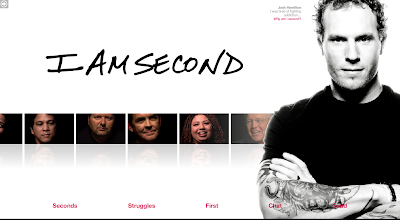 Love Willow Creek's new website. Very cool. Too bad we didn't stream our services at Cornerstone. They had a candlelighting ceremony (yes, without me) and I got word that someone accidently lit a program on fire. Thats pretty funny. Good thing no one died and the carpet wasn't ruined. I have a huge frog in my throat. Its really frustrating at the moment. Ate breakfast with this guy this morning before leaving South Carolina. Got to see my cousin Pheobe over the holidays. Thanks for your prayers for her. Apparently I spoke to soon. Doctors are trying to rule out Lupus. She has a serious condition but she is still undergoing tests. Glad to be back in the V-A. Ok, Crawford outta here. Headed to eat wings and watch football! 1 Comments Published by Terrace Crawford on 12/27/08 at 8:16 AM. If you enjoyed Dave & Terrace's Christmas favorites, you'll be sure to enjoy Henrietta and Merna's rendition of "Go Tell it on the Mountain!" 0 Comments Published by Terrace Crawford on 12/25/08 at 6:43 PM. I made you a painting for Christmas. It started out as a star... then a Christmas tree... then lights. Not sure what you see in this painting... but I just call it "Christmas 2008." Merry Christmas to you! May you find real joy through Jesus Christ, our Saviour, this Christmas. 2 Comments Published by Terrace Crawford on 12/23/08 at 3:38 PM. 1 Comments Published by Terrace Crawford on 12/22/08 at 8:13 PM. This is the Manic Monday Minute ladies and gents - Christmasy edition. Had a uber busy weekend. Excited about NewSpring's newest campus launch announcement. Columbia was my very last residence. 25 free Christmas music downloads here for you my readers. The weather outside is definitely near frightful. I know that chilly temps set the scene for Christmas day... but I really kind of liked the 75 degree temp we were rocking last year this time. Hoping to finish this guy's book over Christmas. Only 8 days left to buy some shoes! Hurry, go donate. Gave my car a good, thorough cleaning today. It thanked me. Then I filled it up with gas. It thanked me again. I know you've heard the song by Beyonce called "Single Ladies." There have been TONS of vids circulating the net of people covering that song. None of them quite touch this one. Ate dinner with @churchydave and @kimdaniels tonight. They gave me a collection of Russian nesting dolls for Christmas. I think I laughed for 9 minutes straight! (If you didn't get that, you desperately need to watch the movie Nacho Libre). Say a prayer for my cousin, Pheobe. Our family has learned that she has been diagnosed with Lupus. Hitting the road for South Carolina bright and early in the morning. Road trips=good. Road trips without traveling buddy=bad. 2 Comments Published by Terrace Crawford on 12/18/08 at 1:23 PM. I am typically the last one to leave at church. Sure, I'm a beautiful social butterfly... as some have described me, but I love people and I like chit-chatting after church. I have never understood people that dart out the front door as soon as the pastor says Amen. What is the point? You could pretty much sit at home and watch a TV preacher for that. The point here is that church is about community. I'll never forget Rick Warren stating at a conference I attended that "you can tell how healthy your church is by the number of folks who stick around when the weekend service is over." Simply put: people sticking around and hanging out shows a depth in relationships. And a depth in relationships and people getting connected leads to a healthy church community. 2 Comments Published by Terrace Crawford on at 6:15 AM. I volunteered a number of hours this year to a charity store for needy families. On Saturday we invited Santa to visit and provided free pictures to attendees. Later I got to speak to Santa myself and I wasn't quite ready for what he had to say. No, it wasn't that I had been a "bad boy" but he told me how moved he was by one child who said that "all he wanted for Christmas was for his family to have a Christmas tree." [Ouch] That broke my heart. The next day I found myself at the hardware store picking up a few things. I was standing in line behind a gentleman and overheard him telling the cashier how he had an abormal passion for Christmas and had been working on his home decor for months - even mentioning he had a ferris wheel, garden of lights... and on and on he went. I spoke up and said "um, Mr. Griswald I presume?" He laughed and said, "actually, I have several inflatables and hundreds of lights in storage that I'm not even using." We are in a desperate need for a shift. In fact, our nation is experiencing a financial crisis thanks to the greedy. It is a big problem... and the only real way to fix things is for a shift to happen. I wish it were as easy as snapping our fingers but its not. I see the classic scenario all the time -- one family is struggling to put food on the table and their neighbors are geeking out their home next door... and constantly wanting more. Sadly, its found in common place, America. Population: too many. So whats the answer? Well, I personally think its the church. But it begins with YOU. It will take steps... or rather a shift to bring radical results. Aren't you tired of the materialistic society we have found ourselves in? A pastor-friend of mine told me that he started challenging his kids when they were young to giveaway their favorite gift (under the Christmas tree) to a needy child. He told me how they give cheerfully and have been changed by this challenge. Two social justice teachers decided to change their lifestyles and practice what they teach by committing to live on just one dollar a day. Most of the world lives on just a few dollars a day or less. A lady attending a housing auction provided a bailout miracle for a complete stranger later creating a foundation to help the masses suffering home foreclosure. (This story blew me away). A young man who lives in an apartment complex (with community laundry room) buys extra laundry detergent and leaves quarters behind for his fellow tenants to find them. ...and on, and on and on the stories go. So wherever you find yourself... begin to take steps and shift things in your world. In each of the examples above the masses have been affected. You could say that the shift has hit the fan... and thats a good thing. This post is part of a blogging crossover partnership with Brad Ruggles, Clayton Bell and Zak White. I encourage you to check out their sites. 14 Comments Published by Terrace Crawford on 12/17/08 at 10:18 AM. 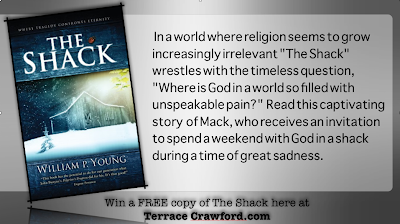 Here is your chance to win a brand new book that is hot off the presses from my friend, Mark Oestreicher, Youth Ministry 3.0. This book won't be released to bookstores until February 2009 but you can go ahead and get your copy exclusively through the YS Shop online... er... win it here! 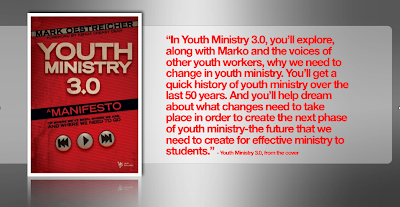 The book is called Youth Ministry 3.0 and is about how Youth Ministry has evolved over time and provides you with lots of thoughts on where we need to go from here. For this contest I thought it would be fun for you to come up with a throw back of sorts to Youth Ministry 1.0 or even 2.0 (which were never written) and the classic quotes from those books. Make sense? You are basically coming up with text that we might have found among the pages of YM 1.0 or YM 2.0. I might encourage you to provide mentions of what YM 1.0 or YM 2.0 type-ministry looks like, commentary on why that worked or did not-so-much work, etc. Be creative, be funny... and give it your best shot. After all, that may secure your FREE copy of this book! You can enter as many times as you like before the contest ends -- Friday, December 19, 2008 at 5.00PM, est [Entries only accepted in the comments form of this post]. Ready? Now, GO. My personal review of the book is coming soon! Stay tuned. 3 Comments Published by Terrace Crawford on 12/16/08 at 1:42 PM. Did you hear the news yesterday about President Bush dodging the flying shoes during a press conference in Iraq? An Arab reporter displayed his contempt for our president and a vid mashup is making the rounds on the internet today as part of a replay with Austin Powers clip. Really, who throws a shoe? 5 Comments Published by Terrace Crawford on at 9:01 AM. We've been blessed by some incredible volunteers at Cornerstone who get the vision... but there have been some along the way who didn't get it. 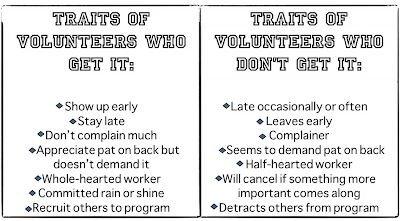 Pretty soon you find out because they aren't a part of the program anymore. They perish. Site Shout: Online Missions Trip? 0 Comments Published by Terrace Crawford on at 12:08 AM. Summer is when most people plan their missions trips but what if I told you that you could take a group of people on a FREE missions trip, redeemable at any time. How does that sound? My good friend, Tim Schmoyer, has created Online Missions Trip.com and you need to check it out. This online missions trip is a two week outreach campaign for leaders (adults and students) who want to share their faith using the tremendous social opportunities that exist on the internet. There are videos, downloadable training resources and more available at the click of a key and absolutely FREE to you on this site. Very cool idea. 4 Comments Published by Terrace Crawford on 12/15/08 at 8:22 PM. This is the Manic Monday Minute ladies and gents. Have I mentioned how insane December is? Know that song "Wake Me up When September Ends?" Yea, we'll just go ahead and change that to December. JK, I love December. I just get worn out from the rigorous schedule. Had a long meeting with my pastor today. I love that man. An incredible, humble servant. Haven't finished putting up the Christmas tree yet. Pretty sad, right? Isn't it almost Christmas? I've got to be the last one to do this - for sure. Will Ferrell marathon was on the TBS this weekend. I watched every movie. Weather was warm today! So odd. Working on something HUGE for the new year. Can't announce until January ... when I start to roll it out. Keep watching the site for details! I'm planning to give away several resources this week here on the blog and on twitter. Headed to Nags Head\Cape Hatteras on Saturday. I'm stoked! I love lighthouses ... and that is my fave. Had a late night chit-chat with this guy last night by phone about ministry. I incredibly value his opinion. I really want to plan a long weekend trip to NYC. Too bad it might be a bit after the Christmas lights come down. Started reading this guy's newest book. Only 15 days left to buy some shoes! Hurry, go donate. Its been a long day. Very eventful. Doing a blogging crossover this week with this guy, this guy and this guy. I'm pumped. A local pastor I meet with bought me a Christmas present. He asked me the other day if I had ever shot a pistol and then told me that he bought me time at a shooting range. 7 Comments Published by Terrace Crawford on at 1:02 PM. This is actually Matthew 6:33 in Chinese. Does this scripture mean anything to you? It means a lot to me. When God speaks to your heart you never soon forget it. NEVER. I have been forever changed by the words he has spoken to me. Each word, phrase or whatever I've clung to... as if they were gold-laced. Over five years ago God spoke to me about something specific. It was about a woman. My wife-to-be. No, I didn't have one in mind (and still don't) but that is what I was praying over... and I'll tell you now what He said to me about it. You see, for years I have prayed for a wife. I imagined what she'd be like. I dreamed of her hair color, eyes, how she would make me laugh (that's a MUST-have), etc. But its never come to pass. Doesn't mean it will not come to pass. God said it would... and I can take that to the bank. Some people have trouble hearing from God. Others doubt He speaks or consider it very mysterious. All I know is, you KNOW when He speaks to you. One day I was sitting in my chair at home and I was very upset with God. I did not understand why he had prolonged such a great gift. Most of my friends got married right out of high school. Many of my friends got married while in college. I've had many people try to set me up. Yes, several blind dates gone by. I even had a creative friend, who I worked with in radio, that asked me about getting dressed up in a tuxedo and wanted me to set a table up at a bridal fair at our local civic center to meet prospects. He thought it would be a great publicity stunt and maybe even secure a genuine prospect for me. Wha? Yea, I dropped him from my Myspace Top 8 real fast after that idea. So I'm sitting there upset with God and demanded that he speak to me on this particular area of my life. Pretty soon He did. He simply whispered Matthew 6:33 to me. Actually, not the scripture... but the reference. Odd right? I knew I was not making this up in my head because at the time I had no clue how the scripture read. I bolted over to my desk, grabbed up my Bible and read these words: "But seek FIRST His kingdom and His righteousness, and ALL these things will be added to you." WOW. That is gold to me. I will treasure this scripture forever. For five years I've been learning what it means to really seek His Kingdom. Perhaps I'll share that in future posts. For now, I wanted to share this-a very candid moment-with you, my readers. Some may ask "why would you share something so private publicly?" For a period of time it was very personal to me. Still is. But I've counseled many, many young men who settled for less than God's best or have dealt with depression over this very area in their life. My experience seemed to really encourage them. So I share it here, publicly. Hang in there young men (and might I add, young women)... seek God... and this too will be added to your life. May this scripture offer not only instruction to you as to what to do while you wait but also encouragement in your personal journey. 0 Comments Published by Terrace Crawford on 12/12/08 at 2:25 PM. On November 11th I joined hundreds of other bloggers in a grassroots effort to help raise 50,000 shoes in just 50 days. . .
With every pair of shoes you donate you’re entered for a chance to hand deliver your shoes in person on a Soles4Souls trip to Mexico! If you donate $25 (10 pairs of shoes) or more you will receive a free jar of “Save My Sole” foot cream compliments of one of the corporate sponsors, Underology. There is a 1-for-2 match going right now. That means that if only 1000 shoes are donated by 11:59 pm on December 13th, a sponsor will donate an additional 500 shoes! Please, go donate. Only 18 days remain! Your help is appreciated. 12 Comments Published by Terrace Crawford on 12/10/08 at 2:32 PM. I'm borderline coveting. Just being honest. These are definitely on my wish list. 3 Comments Published by Terrace Crawford on 12/9/08 at 7:26 PM. Today's You Tubesday post is a throwback to yesteryear when my good friend Dave and I use to do a little podcast called Out to Lunch. This was our first recording [a special Christmas edition] and quite the fan favorite. What is most hilarious about this whole thing is that we actually got emails from people who viewed this on the web asking if they could purchase the CD! We could not believe it. 4 Comments Published by Terrace Crawford on 12/8/08 at 2:17 PM. Bizee this weekend past (as usual). December is insane. Sunday was crazy. I hit a traffic cone on the way to church. Yes, a traffic cone. I was traveling behind this car (going through this construction area) and happened to look away from the road for just a second and wham! there was the cone. I peeled that sucker. Fortunately my car was okay. Played laser tag after our morning worship services. Came in 15th the first game (vs. some little midget army), 16th the second round and finally 9th in the 3rd round (out of 30 players). I think I just heard a gun shot. Not cool. Speaking of, please pray for a lady in our church named Linda. Last Wednesday evening after she left our midweek service she went home and her neighbor, Mark, stopped by to chat for a moment. According to her story he stopped by to say thanks for inviting him to church two weeks prior. They spoke briefly on her porch and then a man rushed up to the porch and pulled a gun on her neighbor. Within moments Mark was shot 3 times and is now in critical care in the hospital. Needless to say, Linda has been traumatized. They both need prayer. Police are conducting a full investigation... that is all we know right now. Had dinner at Chilis tonight. Funny... I had dinner at Chilis last Monday too. Currently doing a series on the Purpose of Christmas. Yes, inspired by Dr. Warren. Met a friend today for lunch over at the barrel of crackers. I'm like Perry, I love the biscuits! Hosting a luncheon this Thursday for the Youth Pastor Network I'm a part of. Can't wait. Saw a lady yesterday with a kindle. I was border line coveting. I'm just sayin. So far we've raised 8,640 shoes. Only 22 days left folks! Go buy some shoes! They are calling for snow here. Rooting for a 'dusting only'. I don't want to be buried under. Ok, I'm out. Lots to get done this week. Better go sleep. 4 Comments Published by Terrace Crawford on at 11:58 AM. One of the things I have found in ministry in the last few years is that it is getting harder and harder to WOW people. You know, to make people say "WOW!" Everyone is so stinking different... and their WOW factors are different too. And thats not necessarily a bad thing. I think I would thrive working for an organization like Catalyst because major event planning and production gets me going. For this post I'd like to use their latest conference as an example of what I'm talking about when I speak of said WOW factor. Exactly how do you plan an event for such a diverse crowd? I cannot speak for their team but I imagine that the thrill of steering a ship like Catalyst would be the response of the audience. If the leadership in their organization were honest they would probably admit that hearing each person say "WOW" is what gives them drive in their planning. They, of course, don't do what they do for applause... or even just for the response... but their planning is for a greater cause -- to impact and grow the next generation of leaders through world-class experiences. One of the things that was most interesting to me after attending Catalyst was the mixed reviews I heard after the fact. Some thought a certain speaker was compelling while another slept through his talk. Others thought the production was too much while another group thought it was just right. Sheesh. We've never been so hard to please. Ben Arment on his blog mentioned that Catalyst raised the bar on the production this year. Were you impressed? Nice theatre in the round feel...360 LED screen...did I hear a WOW? ... and remember the Daraja African Children’s Choir? They led worship for one of the general sessions at the conference. Later in a debriefing with a leader I said "wasn't that cool?" His exact words were "that didn't move me." I laughed. Translation: "That didn't WOW me." There may not be one solid person who doesn't like Andy Stanley speaking from the Catalyst main stage. If there is one I have never met them. He is so favored that Catalyst gave him two slots this year...booked him for the Catalyst One Day events and he will probably be on the main stage in 2009. Does this make you say WOW? What does it for you? What makes you say WOW? 0 Comments Published by Terrace Crawford on at 8:20 AM. Most of you may be familiar with CORE® Training that Youth Specialties has been doing for a number of years all across the country. I've enjoyed these regional training events and attended them when I could but I guess the response from the majority of youth workers in the last couple of years have been less than favorable so the creative minds at YS went back to the drawing board and have since unveiled a new face and format for their localized training seminars called "YS ONEDAY." Session One: The Word is More than Words. The bible is the living and active word of God. It has authority, power and value in the lives of youth workers and students. Session Two: Digging Deeper: Uncovering the Riches of Scripture. Digging deep into the word doesn’t have to be daunting or overwhelming. There are tools and techniques that anyone can use to understand the bible, apply it to their own lives and teach it to the students in their ministry. Session Three: Chronological Bible Storying: Leading Students into a Fresh Encounter with God’s Word. For thousands of years, stories were the key means for Jewish and Christian people to learn and experience God. 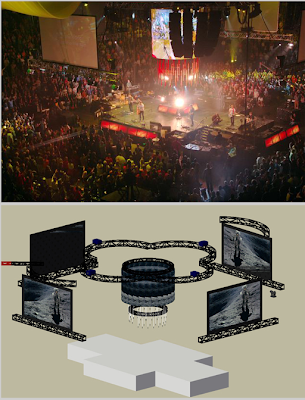 Help students to enter into the entire panorama of God’s story. Session Four: Ideas, Ideas, Ideas: More Ways for your Students to Experience Scripture. The bible is not simply a school book, a text book, or an encyclopedia. The bible is a life book, with deep implications for our lives. We desire to help students experience the Word, not just hear it and we’ve collected hundreds of practical tools and ideas to help you do just that. Check out the training team, dates and locations and even download an event flier from the official website. 0 Comments Published by Terrace Crawford on 12/5/08 at 1:30 PM. Loved this post about book titles. very creative. very funny! A very thought-provoking, heartfelt-yet-controversial post from this guy (who is actually posting final messages to his blog this week). A friendly holiday shopping guide from Seth Godin (via Zak) and a shopping guide for geeks from Kevin Rose. Congrats to Dabo Swinney Clemson's new head coach! I heard he attends this guy's church. My good friend Josh is now doing movie reviews for YouthMinistry.com. He just reviewed Twilight, a movie that I don't mind mentioning that I enjoyed. I would have had more links for you but most blogs were very inactive this week... What did I miss? 3 Comments Published by Terrace Crawford on at 11:38 AM. The secretary is out of the office. I opened today's mail at the church. Few bills, magazines, regular junk... and, an invitation to another church? Weird I thought. Our CHURCH just got invited to attend another CHURCH. What if...we closed OUR church doors this Sunday and attended THEIR church? I think that would be another taste of The Kingdom. 2 Comments Published by Terrace Crawford on at 7:41 AM. 0 Comments Published by Terrace Crawford on 12/4/08 at 7:58 AM. We cannot even begin to understand how difficult this Christmas will be for our military as they are away from their families this holiday season... or the family away from their soldier. Would you like to be able to encourage our armed forces as they serve our country during the holdiays by sending a simple greeting card? You can. Download and print a free card. Learn about other ways to participate. 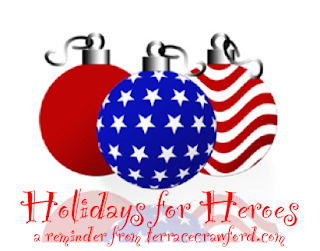 Get the latest news about Holiday Mail for Heroes. Please do not include personal information, like email or home addresses. Please do not send letters. Please do not include inserts of any kind, including photos, glitter, confetti, gift cards or calling cards. Any items inserted into cards will be removed during the reviewing process. All cards received may be used in program publicity efforts, including appearing in broadcast, print or online mediums. 1 Comments Published by Terrace Crawford on 12/2/08 at 8:30 AM. Moral of today's show: Be Kind to the Letter "S"
Brought to you by our friends at the Electric Company. RSS Subscribers: There are videos here. 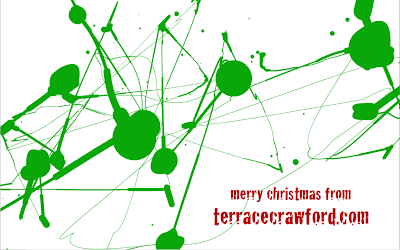 8 Comments Published by Terrace Crawford on 12/1/08 at 7:39 PM. Its the Manic Monday Minute - Birthday edition. Whew -- What a day! I was on the road all day from South Carolina. Great weekend. Speaking of South Carolina, three people in just the last week alone have asked if the state has connections or fascinations with Islam because of our state flag symbols. Short answer is "no." Go here for the history. My phone blew up all day long with constant text messages and phone calls. One thing is for sure: I am so fortunate to know so many people. I literally spent time thanking God today for blessing me with so many friends. I was inundated today with facebook wall posts. 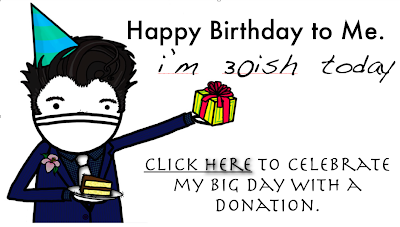 ... and laughed out loud when one person wrote: "Oh the redundancy of Birthday wishes. Happy Arbor Day!" I appreciated every note or tweet but those who took the time to write a few lines as opposed to a quick "Happy Birthday" meant much. Missed my students on Sunday. I hope they missed me. Burdened for a friend who is having marital problems. Had dinner with friends tonight at Chilis. Always enjoy that. This story broke today... which was not big news to me. My mother and aunt both work for the company and their jobs were on the line. Today was 'verdict day'. We praise God that my mother's job is secure and trust God after hearing my aunt's job was cut. I'm still disgusted over the tragedy at Walmart over the weekend. We are in a sad spot in our society. Spent some time in Barnes tonight. I couldn't believe I walked out of the store empty-handed! Bookstores use to be a real weakness of mine. I could drop $50 just walking in one. Have you told me who YOU are? Saw the cover of People Magazine moments ago. I cannot believe its been 10 years since Michael J Fox announced he had Parkinson's Disease. Wow. Looking forward to spending the day in the sticks of North Carolina tomorrow. Headed there to see a Christmas show. Perhaps I'll join Jenny. I'll never forget last time I needed health insurance and called a well known insurance provider. The rep said "Go join Jenny Craig - lose 13 pounds and then come back to us." Wha?! I was a bit speechless that was said to me. Needless to say I got health insurance elsewhere. Busy rest of the week. Hope you have a good one. 1 Comments Published by Terrace Crawford on at 5:00 AM. Today is my birthday. Celebrate with me! Shoutouts welcome: I love a good shoutout. I've already gotten numerous shoutouts even before the big day but you've got several ways to do it... so have at it! You can reach me by email, on facebook, twitter me, myspace it, leave a comment here on the blog, make a video (would LOVE that) and leave the URL in the comments, send me some snail mail or give me a call. Make a Donation: If you've been following my blog recently you know I've been passionate about raising awareness of the great need for shoes around the world. 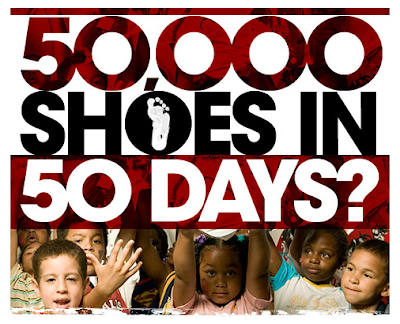 Numerous bloggers have joined this cause to help raise 50,000 shoes in just 50 days. If you had planned to give me a present or a monetary gift, please consider donating to this cause instead. If you choose to donate, please make me aware of your gift.